Jamie is such a big fan of Quilt Dad and my readers that he offered to let me host a giveaway! There will be two prizes this time (edited to add: both will go to one lucky winner!). The first is this adorable DwellStudio sparrow pillow -- an item that I knew all of you quilters and crafters (and lovers of anything bird-related!) would love. With all of the pillow buzz happening around Flickr-land lately, I knew this would be a perfect prize. I think I need to snag a set of these myself for a nephew that we're expecting in December! Unfortunately, due to shipping costs, this giveaway is only open to my U.S. readers. Sorry about that! You know the drill: simply leave a comment on this post, and I'll select one random number as the winner of both prizes. I'll leave the giveaway open until next Wednesday, October 21st. Here's hoping I get lucky! They're both great prizes. Cute! Thanks for the chance. I'm loving that birdie S&P set! I may have to get those for myself! That pillow is great!! My mother in law is a "bird lady" (she has 11 different birds at her house) so this would be a great Christmas gift to give her!! I've wanted those finger puppets for years! I'm not so sold on the s&p shaker you linked to, but I sure would love the stainless sugar shaker! What great prizes. My daughters are busy babysitters and would these puppets not be cute for them to take when sitting the little ones! I personally love the pillow. cool giveaway, that pillow is amazing...going to check All Modern right now! What a fabulous giveaway! Thanks for the chance at a win, and the new site to check out. Oh my goodness, how cute are those?! My two-year-olds would get such a kick out of those finger puppets. Lucky 13??? Hopefully...because I would love either of those prizes. Oh, so cute. :) I love the wide apart eyes on the puppets. They make me think of Joan Walsh Anglund illustrations. Even if I don't win, they are loveky to look at. LOVE the puppets, love the pillow, love chocolate, love cheeseburger, love... Wait, where was I going? Well, I do love the puppets and the pillow. The pillow and puppets are wonderful. I will definitely be checking out that website. Love that owl!! Thanks for the great blog! What cute finger puppets! Would love to win either those OR the pillow! Stop by my blog tomorrow (Saturday) for a giveaway! I am going to have to snag some finer puppets too...my daughter just loves them! Lovely, Lovely! My fingers are crossed. Ooh, goodie! I love the little birdies, and my son would have so much fun with the puppets. i LOVE those finger puppets! How cute are those finger puppets?!?!? I love the pillow and my son would love the finger puppets. How fun and thank you for the oppotunity. Been following you for a bit now - I love your blog! Those finger puppets render me speechless. That's rare, believe me! I really like those finger puppets and the pillow is pretty! Hope you draw my number! Thanks. Such cute things! I need to check them out to get some ideas for the pillow swap, too. Yes, these are great prizes. I have just recently found your blog and I have been enjoying it!!!! Hope I am lucky and thank for a chance to win. What great prizes. I especially like the pillow. Love the pillow. The owl puppet is my favorite! Beautiful! Please pick me! And since I do live in Canada, it's lucky that I have access to a handy Washington box for just such an emergency! Thanks for the link...super cute stuff that I am now drooling over as well! And double thanks for the giveaway my kids will love both of them! Thanks for the awesome giveaway, and quiltdad, you rock! I just love that pillow! What neat stuff. Thanks for the chance. New to your blog and enjoying it very much. ooh! these are great giveaway items! i have several nephews that would very much enjoy the puppets and my son would like to play with his cousins and the puppets. So cute! I love the little finger puppets! Such cute prizes! Thanks for the opportunity! Love ur blog! Love your blog! Thanks for the chance. What a great site! Too bad we have no other events to register for! Great pillow and finger puppets! Thanks for the chance to win! both are way cute. thanks quilt dad for the awesome giveaways! You have a great blog. I can not imagine how you do all of your sewing and have a career as well. Some times I think I am running on slow mo. The chance to win something already made is wonderful! Thanks for the opportunity! I love your blog and missed you when you did not post for a while! Pillows and puppets, what else do you need? Off to Jaime's site to look at more! I love these! That pillow would look lovely on my bed and those finger puppets? GAH! So cute!! What great prizes! I'm going to check out All Modern. Here's to winning!!! Adorable! I'd LOVE to win these!! Like the pillow a lot. Thanks for the giveaway! I seem to have an addiction with birds in my quilting stuff. And my children would love the puppets. Thanks so much for all the giveaway's that you do! Love your blog and all your ideas. love your blog - and love the items in this giveaway! thanks for sharing - I really enjoyed the block tutorials! Sew cute, ( ha ) would love to win, thanks!! The finger puppets are the cutest thing I have seen. I hope I win... I would LOVE to win! Yea if I win! great giveaway! thanks for all your tutorials and sharing your beautiful work. Yippee!! What an awesome giveaway. I love your blog and I'm also making the wonky log cabin quilt with your tutelage! I'm getting the quilt top together this weekend (I hope , I hope). Oh, the pillow is gorgeous! Plus, I am loving the puppets. Maybe I will get lucky! I'm loving the puppets...I know my son would ADORE those!!! Awesome Giveaway! Especially loving those finger puppets--I think they would be perfect inside Oh Fransson's nifty Advent Calendar quilt that I just happen to have made. those are so much fun. yes, great prizes. Thanks for the chance for the little birdies. John, thank you for this giveaway. I really love that cute bird pillow. And I know some really sweet grandkids who would love to play with those finger puppets. I love the pillow! It would look great in my daughter's nursery! Does it help to beg?? I would love to be in your give away. What a great pillow! Thanks for the giveaway! Wonderful giveaways - thanks so much! Oh, I love birds, this is such a cute pillow!! Thanks for the inspiration on your blog!! Those birds are awesome! And finger puppets too! Those prizes are both amazing and would be great springboards of inspiration. Thanks for all the great ideas and tutorials/quilt-along. LOVE that pillow! eek!! If I don't win, I'm totally gonna try to make one. But it prolly won't be near as pretty. Oh well, I just hope I win! THANKS! Thanks for the intro to the site - cute stuff there! Oh, I have perfect uses for both of those wonderful prizes! Thanks so much for arranging the give away. My grandson would just love those finger puppets and the pillow is soooo cute. Thanks for the giveaway. You always find the neatest things. That pillow is just too "tweet". My boys would definitely make use of the finger puppets - they are alway sticking socks on their hands and making them talk. These are so cool. I would want to keep both (even though my baby is already 5 and my oldest is 13). Oh well thanks for the offering and the link to even more cool stuff. I love DwellStudio. That pillow would be great in my daughter's room. You have great taste. I love the items. I love reading your blog its nice to finally have a blog written by a man to read. I love all of your projects you make as well. thanks for sharing with us. Love the bird pillow.....I have a BIRD, myself!! The puppets would be great, too, as I have 17 grandchildren!!! It sure could help me keep them happy! I love the pillow, and how inasanely cool are those finger puppets! Wow! What a neat giveaway! Please enter me. My son would just love the puppets. Thank you. Thank you for sharing these great gifts. I especially love the pillow. It matches perfectly with a quilt I made from the Woodland Bloom collection. Totally adorable! I think my stars are aligned today! What an amazing giveaway. I love the bird pillow and I think my middle son would claim the finger puppets. Such a great giveaway!!! Thank you for the chance to win! I'd love these - something for me and something for the kiddos! Love your blog and inspiration for quilting! Am a bird lover and have grandchildren that would love the puppets. Count me in! Love the finger puppets, too fun! The pillow is also very fun. Great giveaway! Keep all your fun and inspiring projects coming!!! Love following you! wow! super generous giveaway! you rock! Those are some super cool prizes! You have good taste! Great items you're giving away! I especially love those puppets! Thanks for the chance. I hope I have a Lucky Day! Two great prizes! My little girl would love the finger puppets, and I'd love the pillow. I'm crossing my fingers! I love that pillow,it's just darling! and those puppets are too cute! Thank you for sharing the links and your giveaway! Thank you for the giveaway. I'm always thrilled to learn of new creativity and websites. Oh my goodness, those finger puppets are amazing! My son would love those! Thanks for the great givaway! Those birds are awesome. I just bought a quilt pattern for some really great birds, but then decided I might want to give designing my own a go. They're adorable. Thanks for sharing them. wow...that's a lot of comments already! lol great prizes! Great prizes!!! Thanks for the giveaway!!! I have just recently found your blog and it is wonderful! Adorable. I hope I win. Thanks for the chance! Another awesome giveaway!!! Thanks again. Those finger puppets sure are cute. Hi! I just found your blog from Craft Gossip and I think it is great!! The prizes are wonderful, that pillow rules!! how tweet! hope I win ! Well, howdy neighbor! Found your blog via Craft Gossip. We live between Pittsboro and Chapel Hill. Wonderful blog you have! Thanks for the chance to win. What a great giveaway John! So cute! you always have such great taste! Thank you for an entertaining, inspirational site. The pillow and puppets are both adorable. Thanks for hosting this giveaway! I'm teaching my six year old Rosie to stitch on applique. She's doing a purple flower for a pillow. I think the birds are really cute and would match nicely. I love both prizes and the finger puppets give me ideas... thanks for the chance. Such a cute giveaway! I've got the allmodern site open in another tab, so that's my next stop -- perfect because I'm shopping for home stuff too! Oh drat - I would have loved the little finger puppets for my kidlets. Oh well. Why don't you pop on over to my blog and see if you can win a handbag for Mrs QuiltDad? Please throw my name in . . . 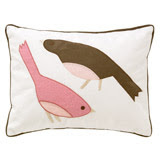 Very cool pillow -- I need to add birds to the decor around here! The cats would love it! 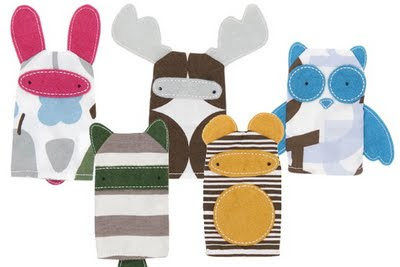 And the finger puppets -- great for my new grand-nephew or -niece. Kinda. Thanks for the giveaway. I love birds!! These are great prizes! I am a follower from Uruguay but I do have an US address so I hope I win. Thanks for hosting the quilt along. I love these prizes, how fun! You are such a busy quilt dad! Keep up the good work! Wow, the prizes look so cute!! The pillow is just adorable! Thanks for the giveaway. Ooh! Pick me! My boys will love the puppets and i would love that pillow! Wow! Great prizes! Thanks for the chance to enter! That pillow is fantastic. And funny enough my nickname is Little Bird. Win or not I must have a pillow like that. I better get sewing. The pillow and puppets are all very cute. I recently found your blog, and as a very new quilter, I'm loving it! great prizes! thanks for doing it! Ooooh...I want those finger puppets! Both prizes are cute, what a great giveaway! That pillow would be wonderful for my daughters room! and she would also love to play with those puppets! Sooo cute! I love the birds! Both such FAB prizes! I'm so excited to see what else they have in their shop! I am in love with that pillow! And I know the perfect two year old for those puppets! Just found your blog and am so intriqued by the idea of guys sewing and quilting. So not where I come from...and encouraging me to teach my boys the art! I love the pillow and know a beautiful head that could use a rest there...and the puppets would be awesome for some lonely little fingers! thanks for the chance to get to know you and for a chance to look at things differently! Hope I'm not too late! Oh how I love those birds on that pillow, pick me! Thanks for the chance! Glad I stumbled across your blog when I did! I love the pillow and have a darling great niece who would love the puppets! ooh! Cute! That pillow would go well with my first bedsized quilt!!! Great darling puppets! The perfect gift for my little granddaughter. Thanks for doing the giveaway, and I hope I win! Oh how fun. Love the adorable finger puppets. Those are fabulous prizes! I am one of the bird lovers...AND I have a 4 month old who I could entertain with those little puppets! LOVE IT ALL...fun stuff. Thanks. Cute stuff! Could I be lucky enough to win another Quiltdad giveaway? Thanks for the opportunity!